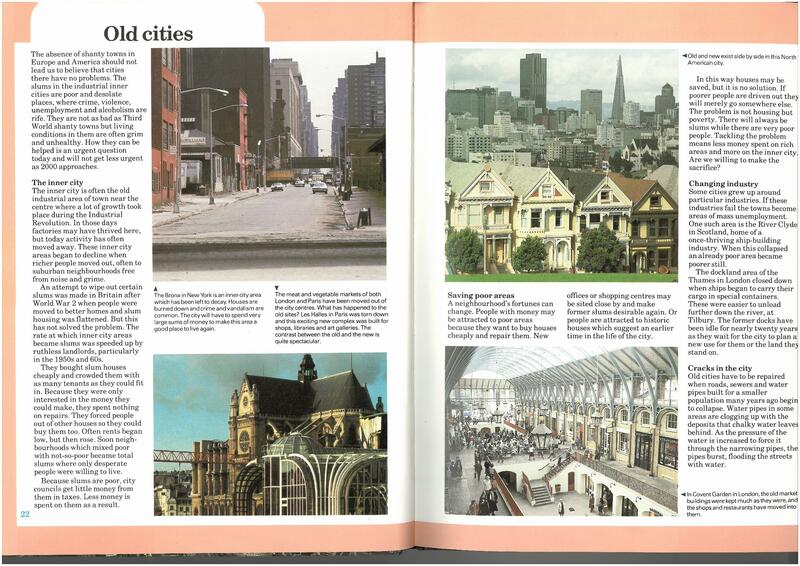 This is part 2 of a 6-part series covering “Cities in the Year 2000”, a kids’ book on cities published in 1985. Here are parts 1, 2, 3, 4, 5 and 6. I suggest reading on a desktop, as the screenshots of the pages should be large enough to read (hopefully). “Cities have changed more in the last 200 years than in the previous 5000. 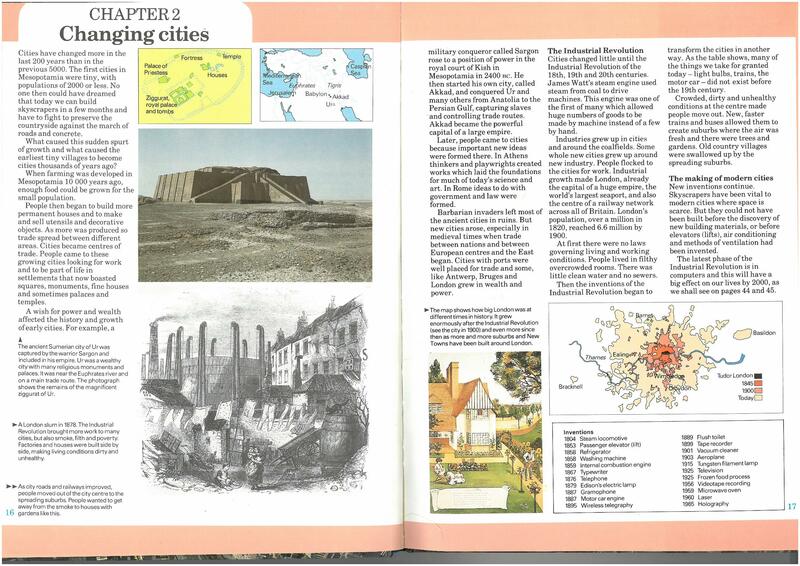 The first cities in Mesopotamia were tiny, with populations of 2000 or less… cities changed little until the Industrial Revolution”. Although the name isn’t quite as famous, the “Agricultural Revolution” which increased farming yields was also very important. Less labour was needed on farms, which freed up people to move to cities. There they could combine their skills with the newly invented machines to produce goods faster than ever before. As with cities, the world’s population grew faster in the last 200 years than it ever had before, and likewise for the world economy. “At first there were no laws governing living and working conditions. People lived in filthy overcrowded rooms. There was little clean water and no sewers. Then the inventions of the Industrial Revolution began to transform the cities in another way… many of the things we take for granted today – light bulbs, trains, the motor car – did not exist before the 19th century”. “Crowded, dirty and unhealthy conditions at the centre made people move out. New, faster trains and buses allowed them to create suburbs where the air was fresh and there were trees and gardens. Old country villages were swallowed up by the spreading suburbs”. “New inventions continue. Skyscrapers have been vital to modern cities where space is scarce. But they could not have been built before the discovery of new building materials, or before elevators (lifts), air conditioning and methods of ventilation had been invented. The latest phase of the Industrial Revolution is in computers and this will have a big effect on our lives by 2000”. “Many European and American cities grew frantically during the Industrial Revolution. Today, most of the old industrial cities have slowed down or stopped growing, and cities in Africa, Asia and Latin America have taken over as the front runners”. This is still broadly true – cities in ‘developing’ countries tend to be growing much faster, and it’s a real mixed bag in the ‘developed’ countries. The top-tier global cities like London, Paris, New York or LA continue to grow, but many cities have had flat populations or even shrunk. You may have noticed by this point that there’s been very little discussion of China. That’s presumably because China was such an unknown quantity in 1985, and in the very early days of economic reforms. According to the World Bank, China’s urbanisation began in earnest in the 1980s – with the population going from 19% urban in 1980 to 58% today. Given that China is the world’s most populous country, this has been probably the largest mass migration in human history. “The Bronx in New York is an inner city area which has been left to decay. Houses are burned down and crime and vandalism are common. The city will have to spend very large sums of money to make this area a good place to live again”. 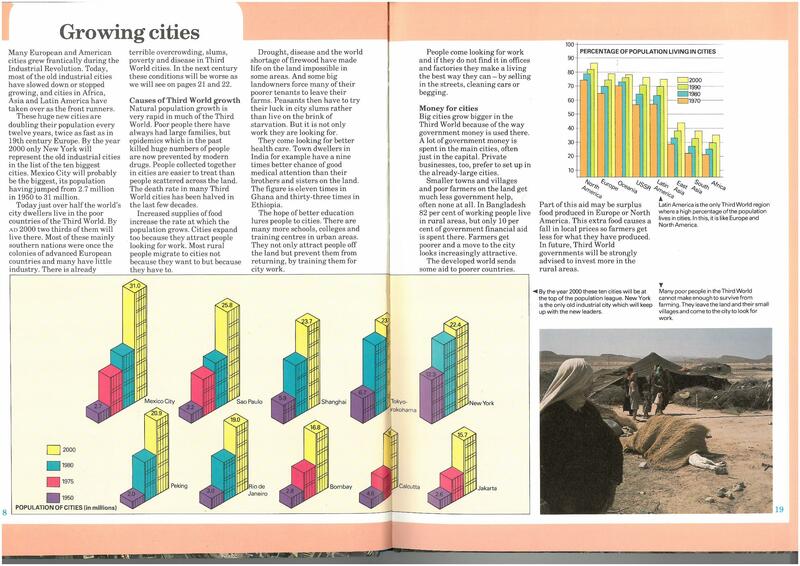 Of course, New York (and Auckland, and many other world cities) have been through the worst of it and come out the other side – the 70s and 80s were perhaps the worst times for cities, and many have had a renaissance since then. The inner city areas are desirable again. However, in a country the size of the US, there are plenty of cities which have not recovered, or have declined further – Detroit probably the best known example. Although NZ hasn’t had an ‘inner city decline’/ suburban ‘white flight’ issue like the cities mentioned in this book – or at least, we’re largely through the issues we have had – we do have a number of towns and cities which have a flat or falling population overall, and many of these are struggling with similar problems. There’s a map of the areas covered here: http://www.population.org.nz/wp-content/uploads/2011/02/nzpr-vol-35_friesen.pdf. I’m looking forward to repeating for 2018, although as we’ve discussed before I think the current Stats NZ population estimates for the city centre are probably overstated. My guess is that it’s probably around 40,000 by now. I’d put no faith in any normally resident population numbers Stats come up with. You might as well use your guess as it is probably got more science behind it that Stats estimates right now. Why do you think they have delayed releasing the Census data sets until next year when over 70% were done online? Because they have to spend so much time fixing up and interpolating from previous data series the missing 10% of the population they never reached this time. While we tend to think of hard to reach places for census purposes as a bunch back of beyond shacks up a goat track down a long gully road with a few old codgers at best living in squalor, which is partly true. The modern twist on that “hard to reach places census takers have to properly deal with” story is that it can be near impossible to reach all those people living in even one single apartment block in the CBD. And thats assuming those living there actually want to be contacted and accurately counted. So how do you accurately count the CBD population when they’re all behind “gated communities” as many of these apartments basically are? Stats current assumption for reaching them in a census relies on everyone having a postal address, with a mail box they clear regularly, and then they read the mail they receive having weeded it out from the screeds of address and unaddressed junk mail. When the real truth is that probably chuck the whole lot of mail in the bin as they never get mail they want. So out goes the census letter as well. The hollow out effect largely caused by industrial pollution near the city. With the rich white moves out, rent in city drops and attract crimals and low income people. Which further ghettoise the area and force good retail and restaurant to close. This cycle continues. As our economy moves to service and clean technology, the pollution effect are no longer here. When the congestion by car dependent spwral react its geometric limit, business and people will choose to locate closer to city. This demand creates a rent gap and fuel opportunities for unban redevelopment. Eventually the renewal of city centre will make the place desirable to live again, without the pollution. Middle class will start to move back to central, creating opportunities for nicer retail and upmarket eateries. Eventually the city will be very desirable and developers can sell high end penthouse units, which further make it more desirable place to live. or…. that people move out to the ‘burbs when they have kids. Most never move back in to town again. More people are living in town nowadays – but then again, more people are not having children. Although I do know a few empty-nesters and people with teenagers who have moved to the city fringe apartments so their children can more quickly get to all their activities. I hope the census will give us good enough information to know if this anecdote is in any way a pattern. Don’t underestimate the hollowing out effect coming from unbalanced investment in and poor planning of motorways and roads. Auckland’s inner city was thriving and dense when pollution was a problem – it was the motorways that did most of the damage. The question is how to speed up the repair. Back to the context of Auckland, I think we are about 10-20 years behind other top tier international cities, due to a few unfortunate issues. – The leaky and poorly designed shoe box apartments in the 2000s really burnt the earlier adopters. That creates a bad reputation and delays further intensification to the city center by one or two property cycles. – The council and AT planning are slow to catch up. They are still stuck in the auto dependency era and hasn’t really keep up with the modern intensified city. – Unlike other international major cities, New Zealand officials are quite inexperience on how to deal new problems. Such as with beggars, homeless and anti social people on the city streets, especially at night. Family friendly amenities like urban schools and public recreation centers has not yet available in the city. 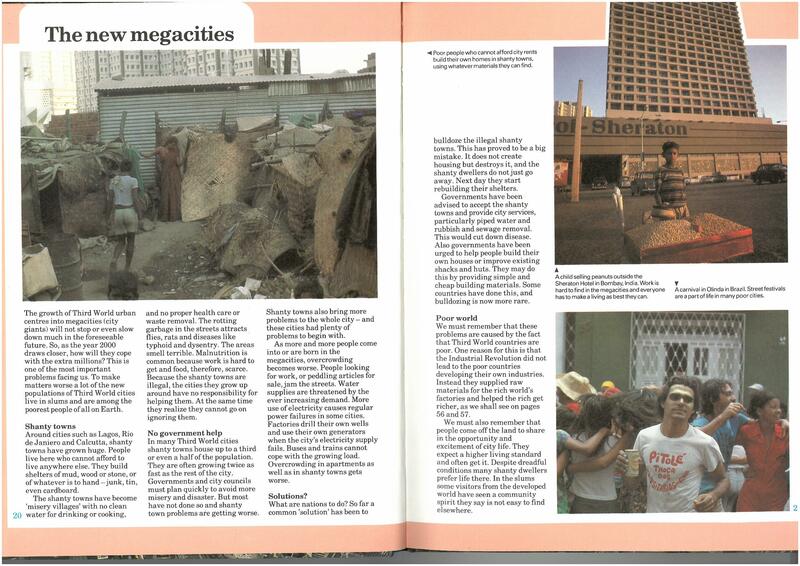 – Culturally we have not really keep up with intensification, people still think living in apartment is a downgrade. City center retail and cafes thinks they should stop trading at 5:30pm, although there are still 30000 people on the street at night. People with kids think they should have a private huge backyard for the kids to kick a ball. But they don’t know other cities residences already use shared public open space and facilities. With those apartments it’s all about the public space around them. Mainly the streets. Look for dr’s posts about Victoria Quarter. There’s your downgrade. With kids, what do you want people to do? For me the city is merely unpleasant, for kids it’s bloody Chernobyl out there. You don’t go out without your parents’ protection suit, um, car. The backyard is their safe zone where they don’t get killed by traffic. I agreed we our city center urban planning is 20 years behind the leading cities. The council and planning has not keep up, the urban amenities are not ready. Which further reinforce the how we negatively perceive intensification. There is a lot of work ahead. My kids (5 & 2) love visiting the city. They like seeing all the people and going to Wynyard Quarter and around the waterfront. And at least there are some areas where cars are not dominant. Unlike the suburbs where cars dominate every space and the only sanctuary is indoors or in a park. That’s just your “park” case. Wynyard Quarter is the sanctuary. There’s still a death zone between that and your home. And compared to going to the park in the suburbs, it may be a shorter walk (or drive), but it’s also much more brutally dominated by cars.